Can You Actually Recreate Real Mario Levels in Micro Land? One of the most promising aspects of Micro Land is the idea of not only building your own levels, but possibly even recreating your favorites from the Mario games. This feature is what drew me into collecting Micro Land and even with the release of Super Mario Maker, the ability to make a Mario level in real life is still very attractive and what I would describe as one of my primary goals of collecting at least up until this point. The question is: can you actually recreate a level? Potential Levels to Recreate – So this gives us quite a few different tiles to work with and a wide variety of pieces to play with. 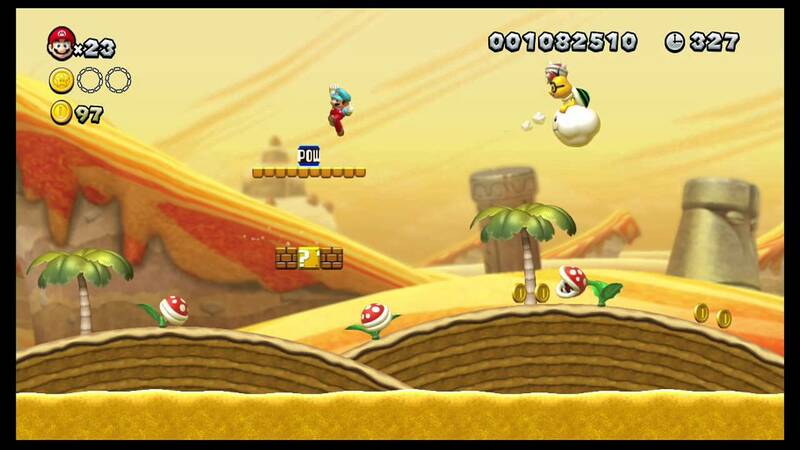 Let’s take a quick look at what levels we can actually recreate using these tiles by examining each of the Layer Cake Desert levels in New Super Mario Bros. U.
Stone-Eye Zone – This level features the Giant Stone Heads, rising and falling sand and quicksand, and a number of different pipes. As far as enemies go, there are Goombas, Koopa Troopas, including flying ones, Piranha Plants, and Waddlewings (or the squirrel enemies as I suspect most people call them). This level has a lot of potential since we have so many different Stone head tiles. Perilous Pokey Cave – This level is underground which doesn’t work well with the tiles we have. It has rising and falling sand which is also something we don’t have. The main enemy are Pokeys and while they would make for a great figure and are a classic Mario enemy, Jakks Pacific hasn’t made any yet. Fire Snake Cavern – This level is in the dark and underground and uses a ton of platforms we don’t have represented in Micro Land so this one is impossible to recreate. Stoneslide Tower – While this level does have Dry Bones, the moving blocks are not represented in Micro Land yet and so this is also impossible with the existing tile set. Spike’s Spouting Sands – While we don’t have Spike (a figure that would be awesome to get in Micro Land), there is some potential for this level. There a ton of Koopa Troopas and Brown Giant Stone Heads. There are flying question blocks and thin platforms we don’t have and probably won’t ever get so it would take some improvising. 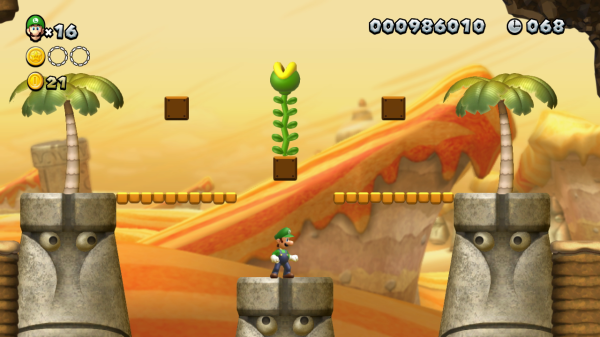 Dry Desert Mushrooms – Spike is the main enemy in this level along with mushrooms that grow longer and shorter and moving platforms. While the Mushroom tile is a common one, there is no way you can actually recreate this level since mushrooms are often above the path Mario has to follow and there is no way to represent this in Micro Land. Blooming Lakitu – Like the name suggests, this is a Lakitu level and he throws Piranha Plants which we don’t have a figure for unfortunately. 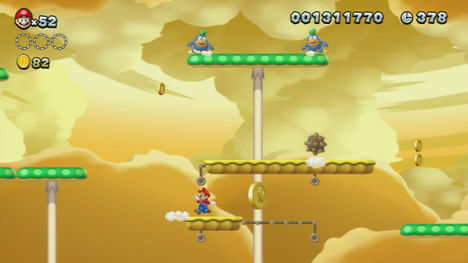 The Spinning Wheels tiles appear often in the level and are the biggest challenge Mario has to overcome. There are also a lot of Palm Trees so the Palm Tree Tiles could be very useful here. This level would become very doable if we could get Piranha Plant figures that stick out of their own pipes. As it stands now, this one is only a possibility in the future. Morton’s Compactor Castle – While we have a Morton figure, we don’t have any lava tiles or moving blocks so this is also a level that we cannot recreate right now. Trying to build the actual level – While Blooming Lakitu is a possibility, we will focus on the first level and breakdown the different parts it has and see what can be recreated using Micro Land. I will go through the level piece by piece and then discuss which tiles can be used to imitate the level. If you would like to see a video of this level, check out the great walkthrough on Youtube by Mario Party Legacy. 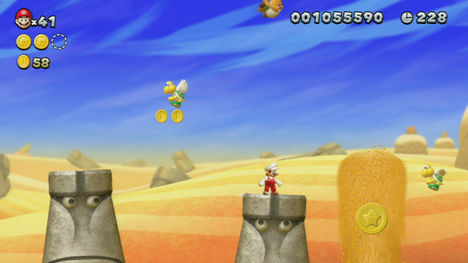 The opening starts with a Gray Stone Head facing Mario, Palm Trees and a ledge. Fortunately, all three of these pieces can be represented in Micro Land. The next section has Stone Head Tiles in quicksand which we have no way of representing and then a ledge with palm trees, blocks, Waddlewings and Goombas. Without having the Stone heads in quicksand, this portion of the level would be hard, if not, impossible to really capture. The next section is not any better with Stone Heads laying horizontally, thin platforms and Koopa Troopas everywhere. Again, other than the enemies, we can’t recreate this. Finally, we get to another section we can recreate. A relatively flat stretch has two Piranha Plants in Warp Pipes separated by Palm trees. We have all of these pieces and can easily add them to the level. After a long hill with some more Waddlewings and coins, we get to the halfway flag which is surrounded by Giant Stone Heads. You could easily do this small section of the level using the Goal Flag and two more Giant Stone Heads. At the same time, it seems unnecessary to recreate this since it doesn’t feel like half of a level yet and the Goal Flag would look odd in two places so we will skip this section. The last section of the level first has a small platform with a Palm Tree and then a number of Gray Stone Heads all surrounded by gaps that Mario has to avoid falling in. There is also some rising sand Mario has to use as platforms here. The Gray Stone Heads can be used, but there is no way to represent the pits Mario can fall in and and many of the Stone Heads are at different angles which we can’t quite show even with the wiggle the Stone Heads have. In the interest of trying to recreate this level, we will go ahead and add a couple Stone Heads here plus a Goal Flag, otherwise, there won’t be much of a level to speak of. Accuracy and Cost of Level – Well first off, there is no denying that this level captures the spirit of Stone-Eye Zone but would still be missing large chunks from the game. That is disappointing and ultimately a sign that we can’t recreate levels from New Super Mario Bros. U. There are many elements of the level like the quicksand and gaps between Stone Heads that are simply not possible for us to represent with the current tiles. As far as enemies go, you would want to get a couple of Goombas and flying Koopa Troopas which we don’t currently have in Micro Land. This makes the level even harder to justify building, because there are more missing pieces that we can’t get. Ultimately, the biggest deterrent is the cost. 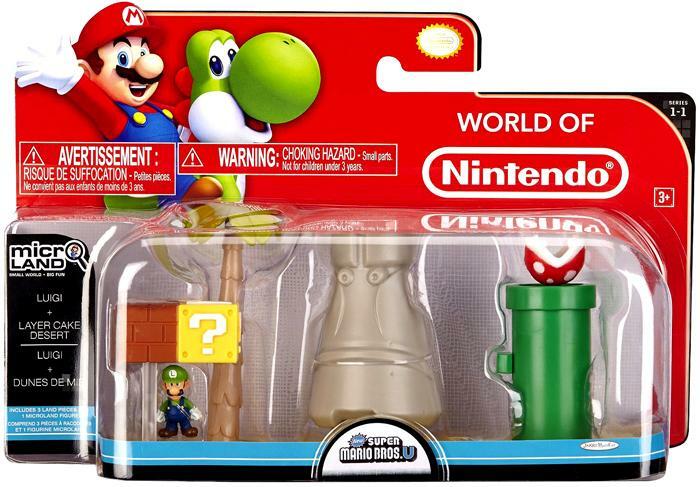 You would need at least two Deluxe Playsets ($36) and 4 of the Playset with Luigi ($44). 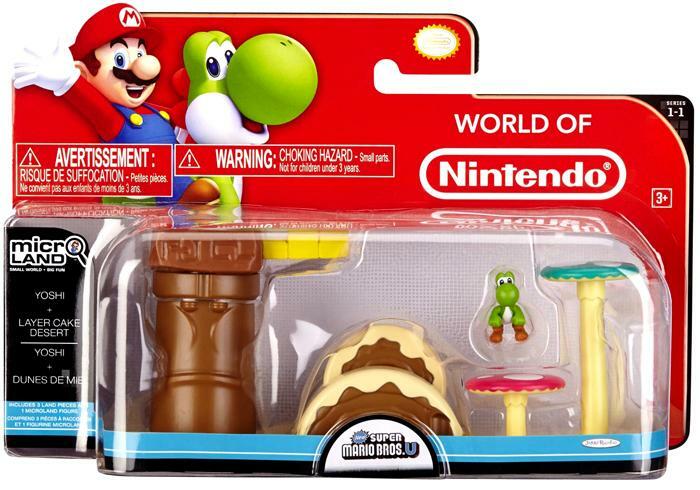 This does not cover several packs of figures to get spare Goombas and Koopa Troopas. This would certainly cost $100 or more in total. While $100 may not seem that bad, when you consider how many extra pieces you will have left over and the fact that you’re recreating half of the actual level, it does not seem worth it. Final Thoughts – So the big question is: what does this tell us about Micro Land? One of the biggest lessons is that Jakks Pacific is taking the most iconic pieces from levels and throwing them together in a series for us to buy. I researched Acorn Plains and thought about writing an article about it like this, but ultimately, the results are the same with those playsets too. This means you can’t easily represent any levels in New Super Mario Bros. U whether it is Layer Cake Desert or Acorn Plains. Instead, the tiles, are kind of like the “Greatest Hits” from Acorn Plains and Layer Cake Desert which take the most iconic or memorable designs and put them on a few tiles. So if you want to build your own levels, you’re better off being creative and coming up with your own ideas. While I think this is cool in its own way, I have found myself struggling with how exactly I want to collect Micro Land going forward. After doing the research and writing this article, I encourage collectors now, more than ever, to collect what you want for your own levels or displays and enjoy the variety of figures that Micro Land gives us. Maybe one day we can represent our own levels, but for now, we can only dream up our own cool displays. 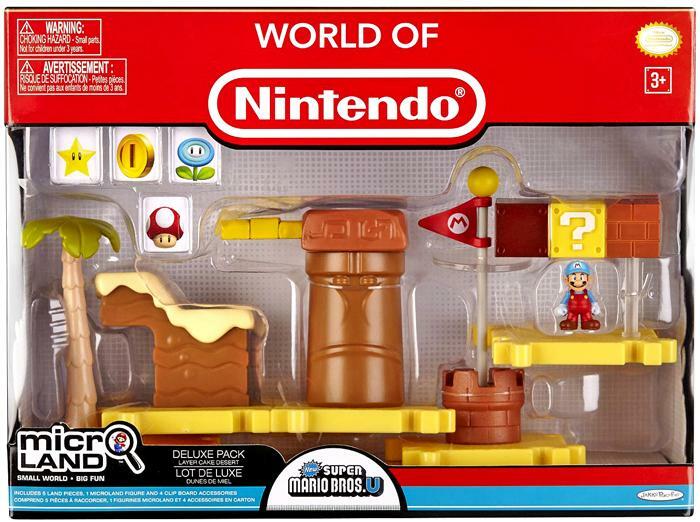 If you have your own level designs or ideas, please let us know in the comments below or send me an email and I’d love to post pictures and an article about your levels here on Nintendo Figures! Previous Nendoroids are coming to Nintendo Figures! Next What are Nendoroids and Why Collect Them?